The Hungry Gap is the period in April, May and early June, after winter crops have dwindled but before the spring crops are ready to harvest. It’s a lean time on UK farms… but this late-cropping Hungry Gap kale offers a welcome glimmer of homegrown greens. Tender fronds on a robust rib, bursting with character and flavour – not to mention vitamins. This is one of the sweeter and more delicate varieties of kale. It can be used raw in salads or whizzed into green smoothies. If you’re cooking it, it’s best lightly steamed or braised then lavished with butter, a squeeze of lemon and a pinch of salt as a simple side. Or wilt at the last minute into hearty peasant-style soups and stews. Delivered from the farm, so wash before eating. Best kept in the fridge and eaten within a few days. 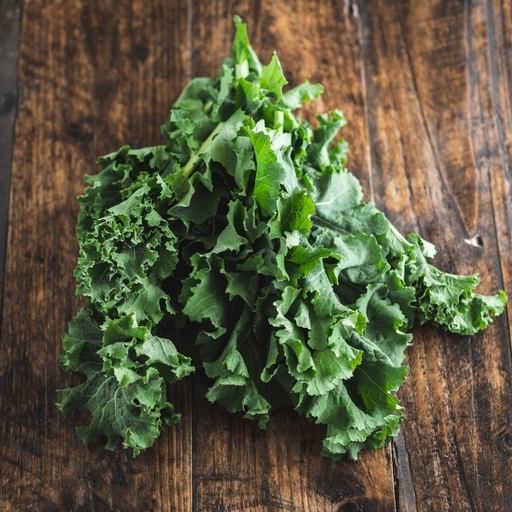 This reliable kale variety is harvested in April. Grown by our organic farming cooperative, the South Devon Organic Producers.